AKT3 from other species may also be detectable. Stability : Store at 4oC (add 0.1% NaN3) for several months, and at -20oC for longer periods. For optimal storage, aliquot target into smaller quantities after centrifugation and store at recommended temperature. For optimal performance, avoid repeated handling and multiple freeze/thaw cycles. 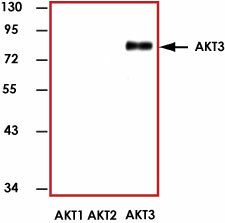 Sample Data : Representative western blot (1:1000) with Anti-AKT3 using 20 ng of human full length recombinant AKT1, AKT2, and AKT3. Scientific Background : AKT 3 or Protein Kinase B (PKB ) is a serine/threonine kinase that is a member of the AKTγ (PKBγB family. AKT 3 is activated in cells exposed to diverse stimuli such as hormones, growth factors, and extracellular matrix components (1). AKT 3 phosphorylates and regulates the function of many cellular proteins involved in processes that include cellular metabolism, survival/apoptosis, and proliferation. Recent evidence indicates that AKT 3 is frequently overexpressed in many types of human cancers including breast and prostate (2).